What's this? Oh, it's my 50-pound ring. Yeppers, I have lost 50 POUNDS!!!!!! And to celebrate, I went to Coldstone Creamery...and had nothing! But James Avery was right next door, and that is where I bought my new ring. 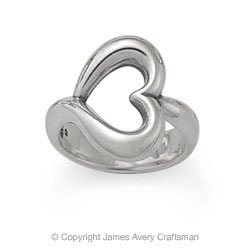 Ok, I'll admit that James Avery was my destination all along. Had ya going there for a second, didn't I?!? The reason why I wanted a ring to reward myself for losing 50 pounds is so I can look down at my hand and remind myself of what I have accomplished, and what lies ahead, weight-loss wise. I still have a lot of weight left to lose, but I have proven to myself that it is possible - I can do it. I lost 50 pounds in six months. I am shocked that I actually started a diet and stuck with it! I am beginning to believe that this time, I will actually reach my goal weight. And stay there. Wow. The ring is pretty and you deserve it for sticking to your goal of losing weight. Keep up the good eating habits and exercise and you will be at your goal weight one of these days. WOOOO HOOOOO! (that is my screaming with excitement!) great job on the loss! That is fantastic! You do deserve a ring. You are really doing it this time! Keep up the amazing work! And Manda, I worked at BR my senior year of HS...oh the memories! I'll have to email you later to compare notes! Sadly, the BR's in our town all closed about 8 years ago - now it's Coldstone, Marble Slab and B&J's. I miss the unique BR flavors! WAY TO GOOOOOOOOOO!!! Great job - you'll be my inspiration as soon as I get back on the wagon...have had a TOUGH last 2 months, and have completely lost my will to diet. I intend to get back with the program right after Christmas. I think a new picture is in order!!! Nice to hear from you, Angie! You won't be sorry to return to the world of weight-loss, I promise!